Just for you gals, crazy about pink. 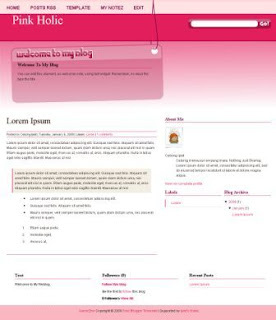 My Pink Holic blogger template. selamat menikmati pundi pundi dolar ya bong, gugel adesensku dibanned!! @ndop:wew kok di banned? kenging nopo? whats wrong? Hi. I'm here again. :) I started to use this template on my entertainment blog. How can I insert smiley? Can I get the code? And the author photo comment, I want to remove it. great template ,but only girl using. pls you make this template , blue and black version ..
sorry poor english, from turkey.. I am using this template on my blog http://fabulous-find.blogspot.com however I cannot get the search button to work. Does anyone know how to fix this? Oops thank you..that was kind of obvious lol. Hello, it's me Jennifer again! I am having problems with the banner of my blog. I changed my url recently from http://fabulous-find.blogspot.com to www.fabulousfinds.ca and now, my banner is missing! Do you know how I can fix this with this template? hi jennifer, which banner is? The top banner is not showing up when you go to www.fabulousfinds.ca it's just plain white and it's supposed to have the pink banner with the welcome to my blog box! @jennifer: but I see it, it appear normally. The banner with the text, welcome, im twenty something... is it? Yes, it's showing up on my friends computer too so perhaps it's just something wrong with my browser. This is frustrating lol. Ok, I'll just sit tight for a few days and see what happens. Hi! First of all I would like to thank you for creating such an awesome template =) Fits my blog perfectly. Erm, I just have a small problem which I can't fix. How do I insert text into the 'Welcome to my blog' space just like in your preview? tpi klu misalnya aku mau ganti judul "Pink Holic" nya gmna? ?